Reformer of Islam Maajid Nawaz appeared on Tucker Carlson’s Fox News program to describe what the Southern Poverty Law Center (SPLC) has done to him, labeling him an “anti-Muslim extremist,” which could not be farther from the truth, and SPLC knows that. Nawaz has challenged Islamist organizations and it is his goal, through his organization, Quilliam, to contribute to truly reforming Islam into a “religion of peace” worthy of inclusion in Western society. SPLC was forced to pay Quilliam and Awaz $3.3 million for labeling them as anti-Muslim extremists. 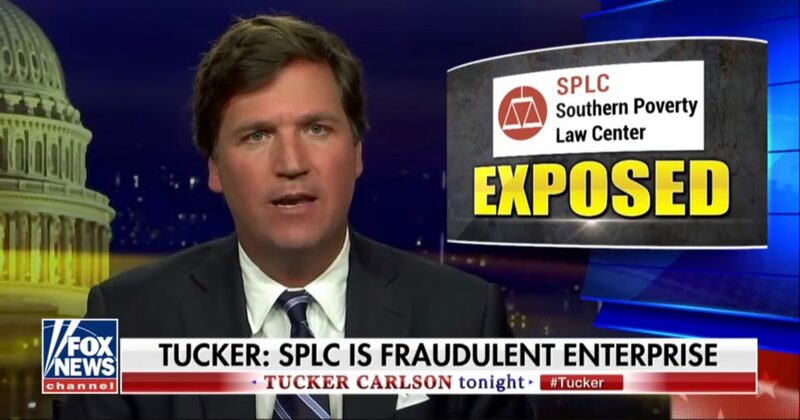 Carlson pays particular attention to the ties between SPLC and the FBI, a strange relationship no doubt born and fostered during the administration of Barack Hussein. Why would the FBI have any relationship at all with the totally discredited organization which routinely lists conservatives as right-wing extremists and white supremacists, and which supports all liberal causes and openly hates all conservatives and conservative groups? For example, SPLC does not list Antifa as an extremist group. Really? Yet, they do consider Ben Carson a flaming extremist. And, as unbelievable as it may sound, SPLC does not list Black Lives Matter, responsible for inciting mass murder, as an extremist group, which they justify thusly on their own website…. Why doesn’t the SPLC list Black Lives Matter? We have heard nothing from the founders and leaders of the Black Lives Matter movement that is remotely comparable to the racism espoused by, for example, the leaders of the New Black Panther Party – and nothing at all to suggest that the bulk of the demonstrators hold supremacist or black separatist views. Indeed, people of all races have marched in solidarity with African Americans during BLM marches. SPLC is also the group that listed conservative Christian Dr. Ben Carson, President Trump’s Housing and Urban Development Secretary, on its “extremist watch list” in 2015, where he stayed for months until, under pressure, he was removed from the list. News of the ties between the FBI and the SPLC, an organization that, in my opinion, should be labeled an extremist hate group itself for its wholly biased support for liberals and open hatred for conservatives, is no less than stunning and should be looked into in much greater detail. However stunning that news is, keep in mind that Fascistbook uses SPLC to determine which sites are conservative extremist hate groups that should be banned or restricted on the social media platform, and those which are contributing thoughtful and liberal fair commentary. THAT is the war we conservative publishers, extremist haters in SPLC’s estimation, fight on a daily basis. Now, we discover that this incredibly biased extremist hate group has ties to the FBI. Based upon the recent congressional testimony of Peter Strzok, it all now makes sense.